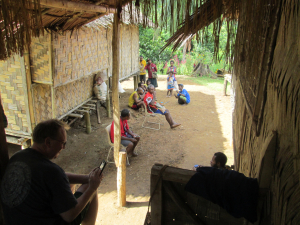 Today is the last day of our fieldwork in Papua New Guinea. I’ve been here for the past 3 weeks or so with anthropologist James Leach piloting the first stage of a new kind of toolkit designed to help remote indigenous communities document and record – in their own hand and forms of expression – the kinds of traditional cultural, environmental, ecological and social knowledge (“TEK”) that are in danger of gradually fading away as development, resource extraction, industrialisation and the money economy erode their ability to live sustainably in the bush/jungle. I flew to Perth in late February to spend a week with James preparing for our trip : gathering the gear we’d need to be able to co-design booklets using bookleteer offline in the bush, print them out and scan them back in, as well as documenting all these processes. 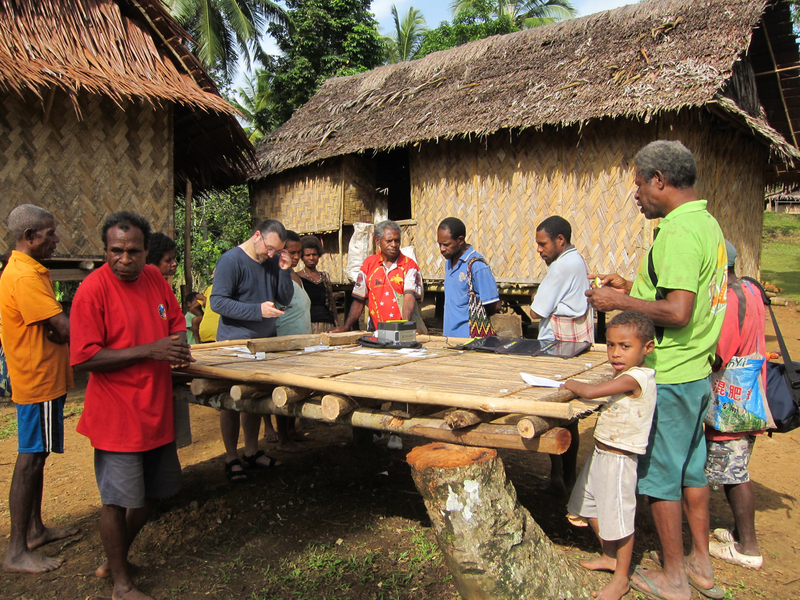 James is currently on an ARC Future Fellowship at the University of Western Australia, as well as Professor and Director of Research for the French Pacific Research Institute, CREDO in Marseille. 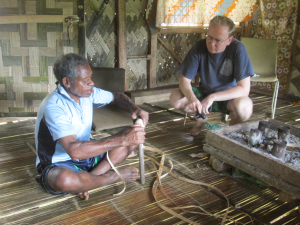 He has been working with the people of Reite village on Papua New Guinea’s Rai Coast (Madang Province) since 1993 and his 2003 book, Creative Land (Berghahn Books), is a major anthropological study of their culture and society. James and I have been collaborating on ideas of self-documentation of traditional knowledge and “indigenous science” ever since I introduced him to the Diffusion eBook format and bookleteer back in 2008. 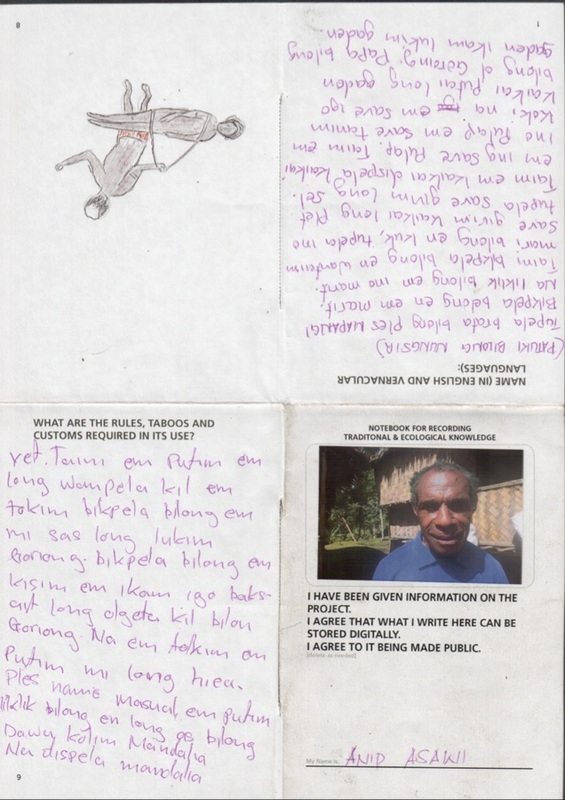 When two Reite people, Porer Nombo and Pinbin Sisau, came to the UK in 2009 to take part in a project at the British Museum’s Ethnographic Dept telling stories and giving information about hundreds of objects from PNG in the collection, we first used the notebooks together to create a parallel series of documents about this encounter and what was revealed. In 2012 I was invited to share my thoughts on how bookleteer and the books format could be used by indigenous people themselves at the Saem Majnep Memorial Symposium on TEK at the University of Goroka in PNG. We followed this up with a trip to Reite village where we spent a week testing out our ideas with people from the village, and developing a simple co-design process for creating notebooks with prompts to help people (whose literacy varies dramatically) record and share things of value to them. The focus was to understand how far this idea could really deliver something of use and value to people who live a largely traditional way of life in the bush, and why they might want to do this. It became clear early on that the enormous enthusiasm was driven by concerns about how all the knowledge that has allowed their society to thrive in the bush for countless generations could easily vanish in the face of money, cash cropping and the speed of communications and change that factors like mobile phones are bringing – leading some young people to turn away from traditional life for the dubious advantages of a precarious life in the shanty towns on the edge of PNG’s growing cities. The notebooks offer a new kind of way to preserve and transmit such knowledge for future generations, especially as they combine the physical and the digital, meaning the loss of a physical copy of a book doesn’t matter when it has been digitised and stored online. The success of this first experiment enabled us to write a proposal for funding a 2 year pilot to the Christensen Fund (a US-based foundation) which awarded us funding in 2014. After a brief stopover in Canberra to consult and share ideas with Colin Filer and Robin Hide of Australian National University (both PNG experts of longstanding), we headed straight to Madang to meet with James’ friend Pinbin Sisau (at whose home we would be staying in Reite village) and gather all the necessary stores to sustain us in the field for several weeks. After a day in Madang we took a dinghy, skippered by the ever-reliable Alfus, across Astrolabe Bay and South-East 60km or so along the Rai Coast to the black sand beach where we landed and were met by some villagers who’d help portage all our cargo the 10km inland we’d have to walk, up into the foothills of the Finisterre Mountains where Reite village is located (at about 300m above sea level). 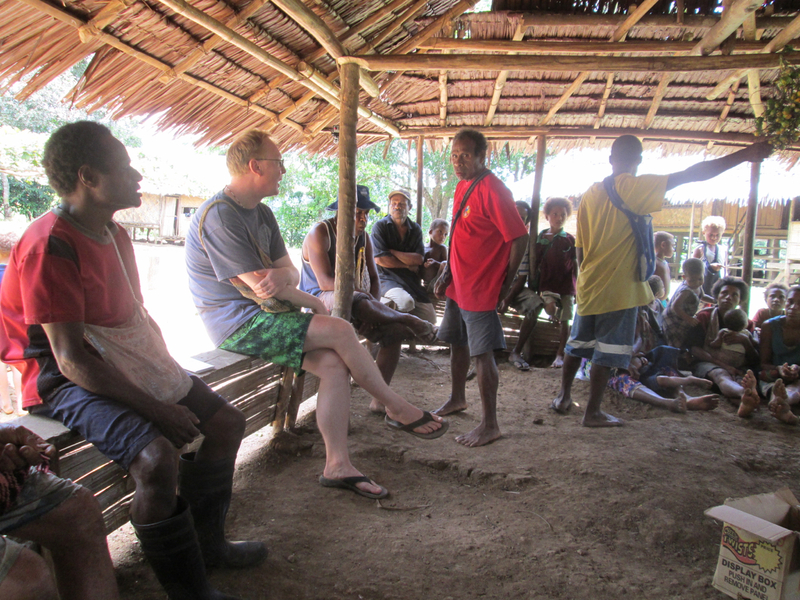 James had visited Reite again recently, in October 2014, to discuss the upcoming field work and to gather more feedback on our original experiment so we could plan how, in practice, we could co-design notebook templates with the villagers and what we could prepare in advance to help this. A few small tweaks to prompts used in our 2012 co-designed notebook were made, as well as creating a simple printed version (I had handwritten all the notebooks we used before) on bookleteer and a new book for collective writing. 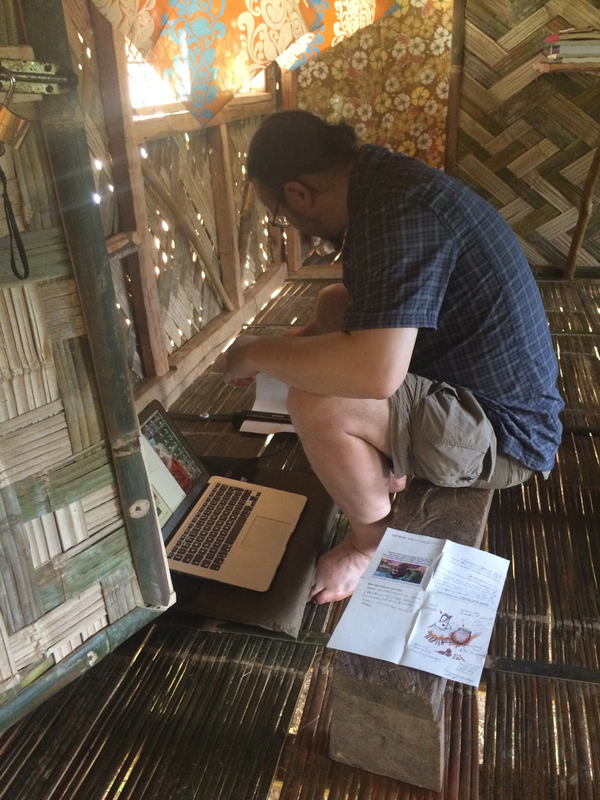 To have the capability to design, generate and print out bookleteer books in the field, I commissioned Joe Flintham (Fathom Point Ltd) – who is bookleteer’s chief consultant programmer – to adapt a version of bookleteer to run offline (i.e. with no need for internet connectivity) on my Apple MacBook Air laptop. Joe created an Ubuntu Virtual Machine image of bookleteer (minus various online services) that runs on Oracle’s Virtual Box application. Combining this with a portable inkjet printer (a Canon Pixma iP110 with battery), a portable scanner (an EPSON DS-30) and the Polaroid PoGo & LG Pocket Photo PD239 Zink printers would give us a fully-fledged ‘bush publishing” capability. For paper we brought with us a supply of Aquascribe waterproof paper (a Tyvek-type product) and pre-printed and shipped some 170 copies of different book templates. The waterproof paper is a highly useful technology to use in the damp and humid environment, where ordinary pulp-based paper becomes fibrous very swiftly and disintegrates in a short time. Books printed and made on this paper (as we used before) have a much longer lifespan – possibly decades. Reite is made up of several hamlets, being the name applied not just to one village but an administrative district from the colonial period. As such the people who took part in our project come not just from Reite itself, but from Sarangama, Yasing, Marpungae and Serieng. 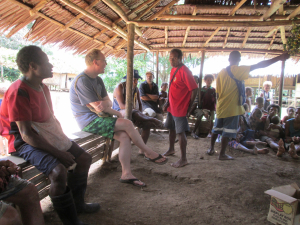 For the next two weeks of our fieldwork we were constantly engaged in discussions with local people about the books, what they might include in them and how they could help reinforce the importance of the knowledge of the land, plants, animals and environment that people here have developed over generations. Once again, James’ long-term collaborator and informant, Porer Nombo, was the hub around which much of the necessary energy to bring people together and discuss the ideas was focused. 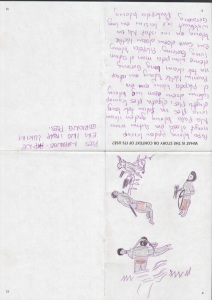 In addition to the 3 templates we had prepared before coming, we co-designed with Porer, Pinbin and several others with a keen interest (such as Peter Nombo and Katak Pulu) another 4 different styles of notebook for a range of different themes and types of ‘stori’ that people wanted to record. Overall, 63 books were completed by around 42 people during the fortnight we stayed in the village. The major difference in this project was that, rather than taking the books away to scan and return, the portable scanner meant that we could scan everyone’s book in the village itself. Thus we could store a digital copy (and print out another if needed) and leave the original in its author’s hands in the village. This was an important step, partly to underscore that the books were by and for people in the village, not for us, and also to counter ideas that we might be taking knowledge away from the village to profit from selling it. For us, the digitisation of the books is a critical component for transmission to the future as it means that the unique books, which are hand written and drawn in by their authors, can be retrieved and printed again if lost or damaged. We explained this to everyone in several meetings – both smaller ones within the house we stayed in, and a larger public meeting about halfway through the project. As in our previous experiment, we designed the front cover of each book to include a photograph of the author (which we took using digital cameras and our smartphones and printed out on the sticky-backed photo paper of the PoGo & LG Zink printers). As well as describing the general themes of the prompts inside each book, the cover also includes the simple statement that the author has been told about and understands the project, as well as statements (which they can cross out if they don’t agree to) that the book can be scanned onto computer, and shared online. As it turned out, the excitement that people’s work would appear on the internet was palpable and a significant impetus behind participation. 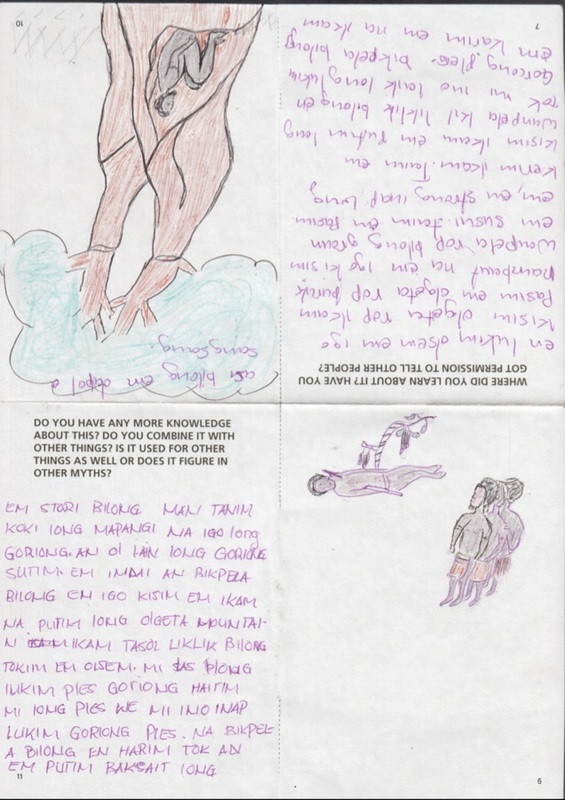 Having something they had made, with their picture on it, on the internet had real value – suggesting that the knowledge they have could both be seen by others around the world and known about across PNG too. 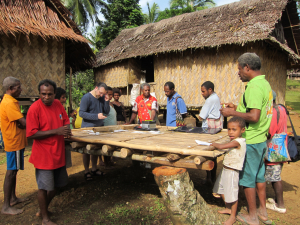 What became one of the most important aspects of the fieldwork was the way that the local primary school (St Monica’s Reite) adopted the books wholesale and wove them directly into the curriculum around social science and environmental studies. We met up with Mr Jonathan Zorro, the school headmaster, in the first days of our trip (I had met him on my previous trip and James again last October) and he confirmed that he was very keen for the school to become involved. It turned out that the school has a desktop PC with a laser printer and scanner, so it became clear that not only could the school print out copies of the books on standard A4 paper, but they could scan them in and store them locally on the school computer. We agreed to spend a day at the school to introduce the project to all the students and then to do some practical book-making demonstrations and workshops with each class. 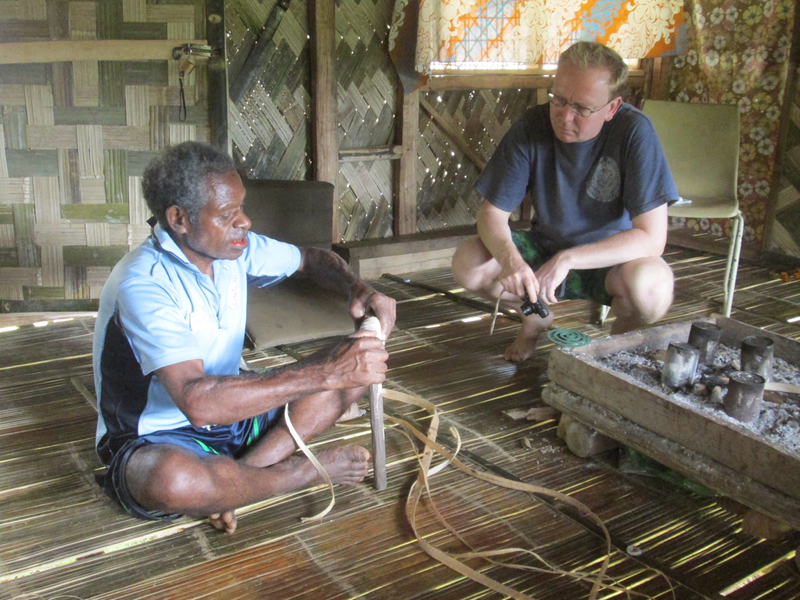 James also agreed to give each of the Upper school classes (years 5-8) a short lecture on the importance of traditional knowledge and how it relates to environmental studies and preserving the community’s way of life. Mr Zorro organised for 290 books to be printed at the school, with one of the key emphases being that the students should use both the Tok Pisin versions and the English versions to improve their language and descriptive skills. Mr Zorro kindly shared with us the assessment criteria which he also developed for the students’ work : assessing their English language skills, their artwork (drawing), narrative ability, use of social science and environmental studies knowledge. Within a week of our first presentation at the school many of the students had submitted books of their own and we ended up digitising 55 of the best ones. We had planned for a visit by to Reite by Catherine Sparks (who is based in Vanuatu) and Yat Paol (based in PNG) from the Christensen Fund’s Melanesian programme, but Cyclone Pam intervened and our own visit to the village was cut short by a few days (due to some health and security issues) so we have ended up completing our fieldwork from a base in Madang. There we presented the work completed to Yat Paol and were also able to arrange a meeting for him with the school headmaster plus Porer Nombo and Pinbin Sisau who have been our steadfast colleagues in this project. 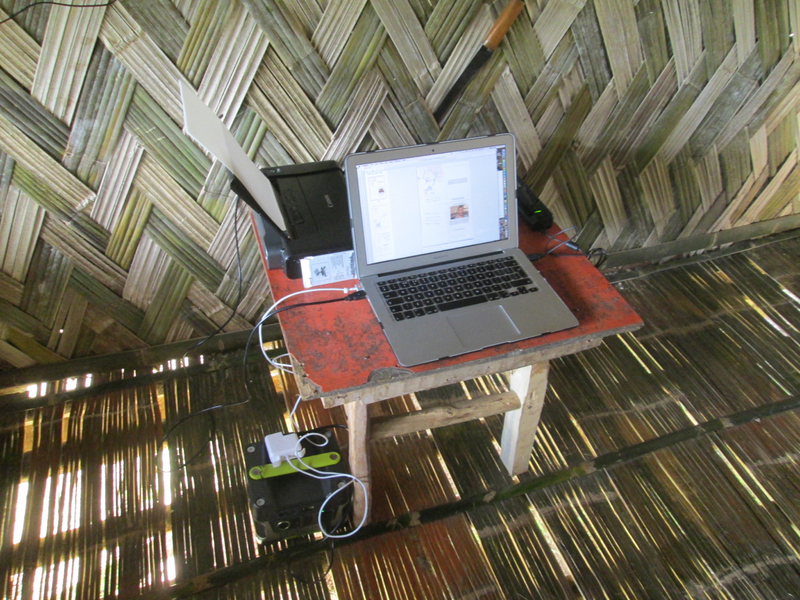 Now we have scanned the 118 books we have been indexing their contents and details of the authors to prepare a specially designed website to act as an online repository of library for Reite, and beginning to analyse and work with Porer and Pinbin on some indigenous classifications for the kinds of knowledge and experience that they contain. As our time here draws to a close we find that we have a wealth of stories to develop new parts of the toolkit from, and a clear sense of direction for the project’s second stage.